And for this flight's write-ups, we've got Mallow Cups against Kit Kats, crunchy toffee bars facing off detestable raisins and so many more. I'm sure you've got opinions, favorites, and cravings, so go ahead and give this a read, then toddle over to Tomato Nation and be part of the system. This is going to be a bloodbath. Over the past ten years, I've come to accept (even love) many foods, but raisins are not one of them. Raisins are disgusting little bits of wizened chewiness that came into being only because some Friar Tuck was too drunk to remember to pick all the grapes. When it comes to Raisinasties, one could argue that sucking the chocolate off and spitballing the withered excuses for fruit across the theatre is a fine way to spend a night at the movies. Except that the chocolate is pretty lousy. The raisin-haters out there are almost as legion as the coconut-haters, and there's no way a wonderfully snappy chocolate-covered toffee bar is going to lose to shriveled grapes coated in barely acceptable chocolate. I'm guessing that these two are pretty evenly matched. Personally, I've only ever had a Charleston Chew once, and the experience didn't thrill me enough to keep me coming back for more. Meanwhile, I love Caramello, so I'm rooting for those fragile squares of drooly caramel even if you have only one chance in a million of getting a Caramello bar with all squares fully intact. I'm going to start a war here, but I don't see the point of plain M&Ms. There's not enough chocolate in them to matter, and there's no nuts. I am a peanut M&M girl through and through, in the same way I'm a walnut-brownie girl. Basically, I need the nuts. However, nuts anger a lot of people (and not just anaphylactically, either), which means there are many more M&M fans than peanut M&M fans. This convoluted logic is all by way of saying that while San Francisco-born Ghirardelli makes some damn fine chocolate squares, chips, and cocoa, M&Ms are too classic to lose this round. Oh, Special Dark, how much I once adored you. 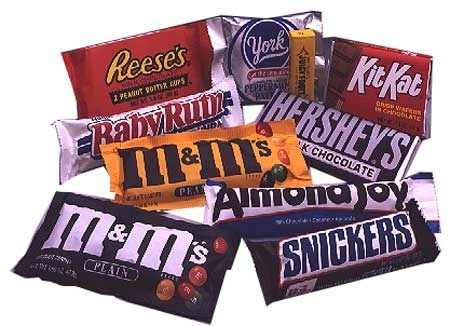 I'd sift through all the other fun sized-Hershey bars and extract all the Special Darks in their understated wrappers (by comparison, Krackels and Mr. Goodbars seemed like trollops with their loud and larry yellow and orange wrappers) and congratulated myself on having a singular palate at such a young age. Now, however, I can't stand the chalky, dry bars that remind me of the time I made the mistake of snatching some Baker's unsweetened chocolate while my mom was making chocolate mousse pies. There are a huge number of dark chocolate fans out there, but since this is a poor example of that genre, I'm pretty sure Mars Bar will take this one handily. My mom loves Mallo Cups. I love Mallomars more than any other cookie in existence, so I should love Mallo Cups, yet? I don't. They're the kind of too-hard chocolate that plays fast and stabby with the roof of my mouth, so I'd snarf a crispity-crunch Kit Kat any day. However, Mallo Cups have a long history and a loyal following. People who enjoyed them as the candy of their youth, adore them in their adulthood. (Probably because as adults, they can finally eat as much as they want.) Still, did a Mallo Cups theme song ever drive Ed Helms nuts on The Office? I think not. Kit Kat will take this one, but only barely. Joyva. Another candy I haven't had the pleasure of eating. Well, "pleasure" might be overstating it, because I'm not tempted by the description of any of the products. Maybe the East Coast and the coconut haters will come out in full force to kick Mounds/Bounty right out of the running, but I hope not because I do adore my coconut candy. This is a really hard one to call, but I'm going to put my money on coconut haters pushing Joyva ahead and hope I'm wrong. This is going to be tough. I mean, who doesn't love The Great American Chocolate Bar? On the other hand, plenty of people who loved Hershey in their callow youth moved on to better chocolate, and Dove is definitely an example of that better chocolate. A recapper over at TWOP -- I think it was either Jessica or Heathen -- once said that Hershey's smelled like baby vomit. I really did like Hershey Bars until I read that and realized how true it was. Also, I can't remember the last time I bought a Hershey bar, yet Dr. Mathra regularly buys the Dove minis (milk and dark) and hands them out to his calc students around Halloween. We always get ourselves extra bags and pair them with pumpkin ale because -- just go with me on this -- it really brings out the pumpkin spice. (Another pairing is pumpkin ale and Chips Ahoy, but that's another bracket.) So, while Dove may never have a city where you can buy chocolate-scented pencils (yes, I still have them from 5th grade and they are absolutely wonderful and still smell like chocolate), I think it's a new American classic and will leave Hershey in the dust. Given my own preference, that shouldn't make me sad, but it really sort of does. Full disclosure: I've never had a Toffifay, and I couldn't find any in the Bay Area to sample before writing this up. By description, it sounds very close to my adored Caramel Tartlet cookies from Trader Joe's, but I think you have to be very special to beat 100 Grand. Is Toffifay that special? I wouldn't be surprised by an upset, but my money (heh) is on 100 Grand.